Product #18010 | SKU LP36353 | 0.0 (no ratings yet) Thanks for your rating! The black Photo Sport 200 AW Backpack from Lowepro is a lightweight pack designed for heavyweight outdoor action and manufactured to handle a rugged trail race, mountain bike outing or photo trek up a local peak. Made from triple rip stop nylon, the Photo Sport 200 not only holds your DSLR with attached lens, but a flash as well in its dedicated Ultra-Cinch Camera Chamber side-access pocket. This Chamber compliments the dual compartment approach to the pack that permits you to carry both clothes, food and camera gear. The Photo Sport 200 can instantly become a shooter's pack. Quickly rotate pack to the front, unzip the pocket, access your camera that is stored in shooting position, pull it out, get the shot, stuff it back inside and you're back on the trail ready to tackle the next pitch. For the hiking part, multiple attachment points on the pack permit you to secure everything from ski poles to jackets, hats, cell phones, keys or a decent-sized pack of trail mix to keep you going. 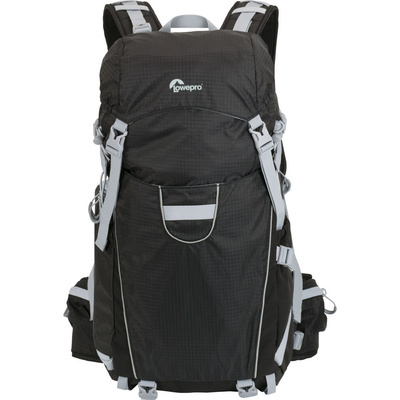 Adjustable shoulder straps and a padded waist belt keep it squarely on your back while a moulded back pad offers more than sufficient airflow to keep you cool and comfortable on the trail. The water-resistant 70D nylon exterior keeps your contents dry but in case you get caught in a rain or snow squall, simply deploy the built-in rain fly that will encase the pack for even more protection. If you're a night person, you'll find reflective piping on the pack so you'll be able to be seen on the trail or road. Additional front and side storage pockets will hold your maps, water bottles, gloves - whatever support gear you have. And speaking of water, there is also a hydration pocket that can hold an optional reservoir so you'll never have to worry about being thirsty on the trail. Backed by Lowepro's limited lifetime warranty, the Photo Sport 200 AW is well-named since it allows you to get out there on the trail to get the "photo", while also allowing you to engage in the serious pursuit of "sport". Ultra-Cinch Camera Chamber protects camera gear in a padded and secure compartment and helps prevent bouncing while you're in motion.